Do you wear your “colors”? I always come out as a “Cool” in color analysis and I’ve shied away from bold, warm colors near my face. But I’m taking a chance here with a vivid orange-red blouse that I think does its job. I find it cheery and Visible for this day of visibility . I’m pairing the silky blouse (sim) I thrifted on ThredUp with an African print skirt thrifted in Toronto with my friends Suzanne and Ally. I think the two pieces together make an unexpected look, and one that’s fun to wear, for under $25. The skirt is lined and almost too heavy for our 90 degree day, but I had to have a change from summer clothes! The floral boots don’t match but they “go” and they’re also fun to wear. I added only my beaded name-bracelet, made back in the early 1960’s by my grandfather Gibbons. My hair is my own today, scrunched and crunched with Curls Rock cream. Sandy just treated me to this gorgeous amethyst, hand-made by a local jeweler. There’s intricate detail engraving on the silver band. Thanks, sweetie! Are you taking some style risks today? Show us in the link-up. Indeed you look cool in this warm color. I adore your African print skirt. This outfit is remarkably beautiful. Your husband chose a gorgeous amethyst ring!! You know me, like you, I am always taking fashion risks. Happy week and happy new month also. The colour suits you so well and goes beautifully with that great skirt. I am not a fan of the colour coding thing. When I worked in retail I remember women coming in with their colour swatches and being so dead set on the exact colour shade , it was never there.I had mine done once and was told to never wear black , I took no notice. Love the ring too. Many thanks for hosting Patti. This skirt is a beautiful piece! This colour looks great on you, Patti. I remember too how Suzanne showed you how that horse dress you bought would look stunning with a slight change of hair tint. I was amazed. So right! The skirt is a fantastic find. Too hot there? 14C (57). Would love to join you in Toronto. Thanks for hosting!! I firmly believe that if you like a colour, you should wear it! You look awesome in this lovely shade of red, and I adore that luscious skirt! What a find! I just unpacked my brown floral Docs yesterday and thought of you! That ring is a stunner – wow, nicely done, Sandy! I’ll be here with some brightness of my own soon! Thanks so much for hosting, Patti! Thanks Sheila! Let’s hear it for the floral Docs. thanks for linking up, xox. Some days I love colour – which is very of the moment – but others I feel happiest in greys and monochrome. And always happy in black! What a lovely gift from the hubby! He really knows your style. I’ve never had my colours done but I know that they change dramatically dependant upon your hair colour. Love this wild skirt paired with the printed Docs and bright top. If you need some cooler weather come on up for a visit! I’ll accommodate your wishes, it’s only 13 C here today. Ok then, I am on my way. My room is ready? And my pug? xox – I’m on my way to your post to read about your life, and the big changes coming soon. Beautiful! 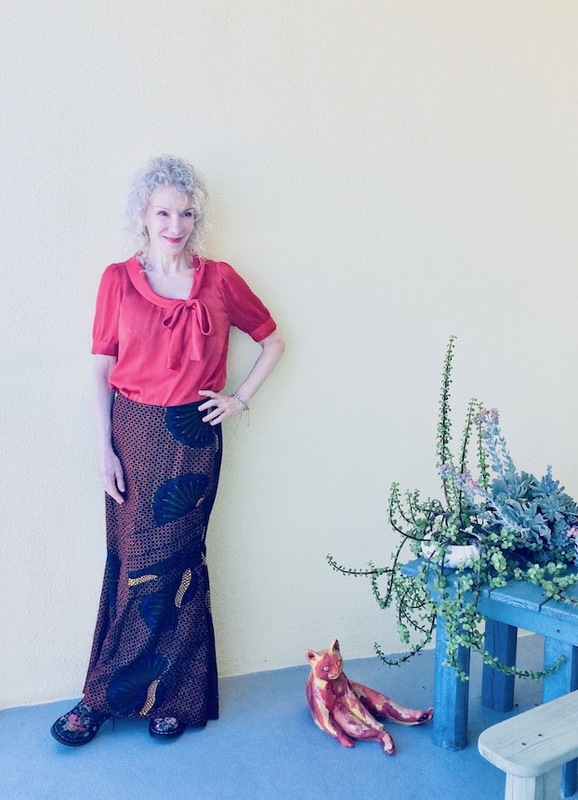 I love everything about your outfit, Patti – the ring is gorgeous, what a treat, your curly hair is pretty, the skirt is fantastic, and this color of blouse is beautiful on you! Very visible and unique! I used to be more color conscious, but today I love and embrace all colors, even those which aren’t considered “my” colors. Colors are fun! Thanks for the linkup, have a wonderful week ahead! Thank you Ann! Loving your chevron-print dress today and how you’ve added even more lovely colors, xox. I think that colour looks wonderful on you, Patti. I love it with the super cool boots and gorgeous maxi and both the ring and the bracelet are just lovely – especially as they have stories attached to them. I love this pretty pink against your skin tone. And of course those floral boots are sweet! i really like this eclectic and fun mix! I certainly feel the almost 5 yrs as a fashion blogger has enabled me to see style and taking risks as a creative, fun way to dress. You look pretty in this bold pink color. I like the bright shade against your neutral skirt, which is so fabulous, by the way! Hi Patti, I really like the cuts and colors of your outfit. I remember seeing a vid recently that stated as long as the undertone of the cooler is cool, the overtone can be warm, or something like that! Love the color of the top. Such a cute look. I’ve been told I was a “winter” or “warm” by people that were into that sort of thing, but I’ve never done a color analysis myself. I just wear what I like and what I think I look good in. I love your new profile picture. It seems soooo you — kinda rocker chick, kinda elegant woman, kinda sweet gal! All good! 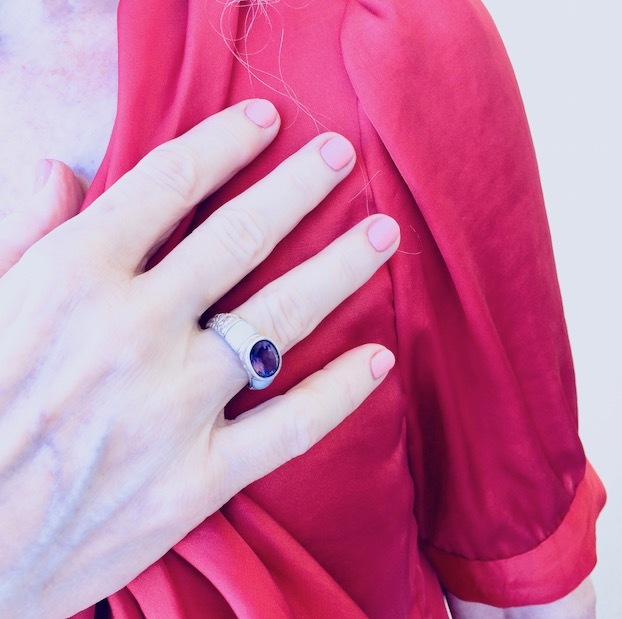 I love the bold red on you Patti, and what a beautiful surprise – the ring! That color looks great on you. Thanks for the linkup. I love it, Patti! Vivid, bright, and cheery! Just wanted I need to see on this gray and cold and rainy day that I woke up to! Your red blouse looks fabulous on you!, and I love your skirt and boots! so cool and autumnal!. What a vibrant colour! You bring summer back here! Patti, the color of your cheery blouse looks great on you and the outfit is fabulous. And your hair looks so great! The whole look has a refined, yet casual vibe that suits you well. Your ring is beautiful Patti! What a wonderful gift you’ll cherish always! The orange-red blouse looks great on you Patti! I love the amethyst ring, it’s beautiful! That ring is so pretty!!! Thanks Stephanie. Your D and G inspired dress is beautiful, xo. I’m probably too much of a color lover. There are times that I’m sure people look at me and feel the need to put on their sunglasses!! But color always makes me smile, and I love this combination on you, Patti!